Outlaw Motorcycle (OMG) and Street Gangs have been active for several years in Washington State. Both Outlaw Motorcycle Gangs (OMG) and Street Gangs have now become entrenched in the region. Street Gangs are involved in a variety of crimes to include drug trafficking, fraud, and prostitution, and have formed alliances with other gangs. They often serve as distribution networks for Mexican National Drug Trafficking Organizations (DTOs). 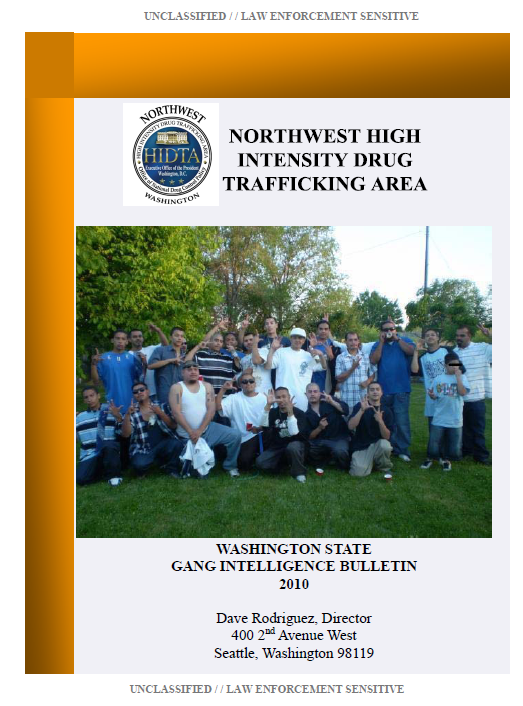 Gang membership and affiliation continue to rise in Washington State. Many gangs have infiltrated Indian Country and cooperated with DTOs, which has enabled them to recruit additional members. Both street gangs and OMGs pose a serious threat to the safety of law enforcement personnel and to the safety of local communities. Outlaw Bikers have been active in Washington State since the 1950’s. Aryan Brotherhood members were housed in McNeil Island in the 1970’s when it was then a U.S Bureau of Prisons (BOP) penitentiary. Nuestra Familia and Nortenos were present in Yakima since the late 1970s. The Mexican Mafia aka La EME (La eMe) and Surenos were active in the Yakima Valley since the 1980s. Also Florencia13 and 18th Street have been active in the Seattle area since the early 1980s. Crips, Bloods, Surenos and Nortenos emigrated from California in the early 1980s. By the mid-1980s, the Gangster Disciple Nation emigrated from Chicago, Illinois and established a foothold in the Seattle-Tacoma area. Other Hispanic gangs, such as the Mara Salvatrucha (MS-13) did not appear in Seattle until the late 1990s. Homegrown street gangs such as the United Latinos were formed in Seattle in the early 1990s. As of 2010 there are approximately 300 active street gangs in Washington State with approximately 15,000 active gang members. This equates to 14 percent of the street gangs and 44 percent of the total street gang members in Washington, Oregon, Idaho, Montana, Wyoming, and Alaska. According to Gang Expert Gabe Morales, one explanation for these statistics is that street gangs in Seattle and King County tend to be large. Many of the smaller gangs were pushed out or members were absorbed by larger gangs. Street Gangs totaling more than 250 members are not uncommon in King County and some have close to 1,000 members. 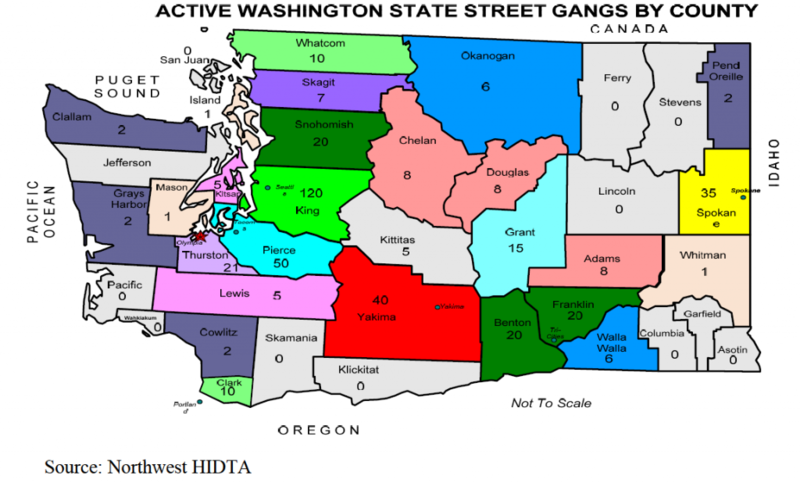 King County has approximately 40 percent (120) of the street gangs in Washington State. Pierce County has the second largest number with 16 percent (50) of the active street gangs followed by Yakima County with 13 percent (40) and Thurston County with 7 percent (21). Some of the most prevalent gangs in the state are Lil Valley Lokos 13 (LVL), Florencia 13, 18th Street, and the 74 Hoover Crips. Most, if not all, gangs use social networking websites to post their activities and to recruit new members as well as using technologies such as the internet, cameras, and police scanners. Gang members also use Facebook, MySpace, YouTube and other networking sites to communicate with each other worldwide, to enlist new members, and to intimidate or threaten their rivals.